This morning was the second part of the Air Force cycling race in Arlington. The 60 mile race around Crystal City occurred on an almost perfect day despite some early thunder showers, but should have been better organized. Racers afterward complained of poor planning and that the organizers of the race were not clear about cut off times. The race was scheduled to start at 7:30, but bikers were not able to actually clear the start line until 7:46 due to the announcers talking on stage. And that 16 minute delay was not added on to the 10:30 cut off time, so many racers who were going to finish the race with a "gold medal" (which you get for completing all 8 laps on time) were stopped early. But the race it self was very rewarding for contestants of all ages and ability. The annual CSC Invitational Air Force Cycling Classic bicycle race is taking place this weekend in Clarendon. Wilson and Clarendon Blvds will be closed from 5am to 3pm both this Saturday to make way for all the cyclists. Come out to cheer the race participants on these beautiful spring days! • Wilson Blvd. from 10th St. to Edgewood St.
• Clarendon Blvd. from Washington Blvd. to Edgewood St.
• Washington Blvd. from 13th St. to Highland St.
• Highland St. from Wilson Blvd. to Washington Blvd. • Garfield St. and Fillmore St. from Wilson Blvd. to Washington Blvd. 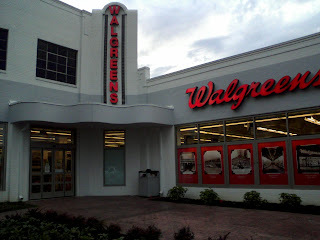 A brand new Walgreens location has quickly popped up where the empty shell of a NTB used to stand. They have not opened yet, but the inside of the store seemed fully stocked and ready for customers very soon. It is located directly across from Iota on Wilson Blvd, which is just a stone's throw away from Whole Foods. 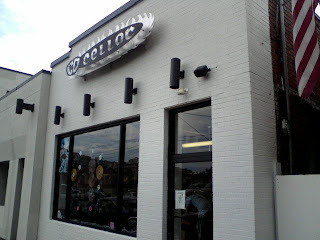 CD Cellar is a great small and local shop that has branch in Clarendon. Located next to Galaxy hut, the unique music store buys and sells used CDs, DVDs, and vinyls. I have always loved the store since shortly after they opened their first location in Falls Church. The shop features a very laid back atmosphere and is always manned by pleasant cashiers. I was able to walk in today with a stack of old movies I know I'm never going to watch again, and come out with cash in hand and a used but pristine copy of T2! I hope this local business will be around for a while. Its very quiet in Arlington right now, as most folks have either gone out of town for the Memorial Day holiday or are visiting the monuments in DC. 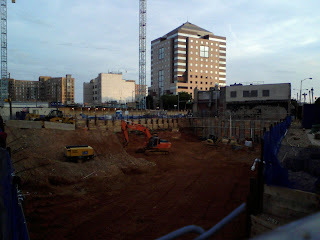 Construction is at a steady pace at the tri-building Clarendon Center. Both lots on either side of Clarendon Blvd are simultaneously being worked on. The pic on the right is of the north side lot behind Hard Times, which is still a hole in the ground. The south lot project is up to ground level now, prompting the builders to construct a covered wood walkway for pedestrian saftety. Monster Band is playing at Whitlow's tonight, and Last Train Home is showcasing at Iota for the second night in a row. Although I'm not expecting many to be out enjoying the warm and humid nightlife tonight. The historic building at the center of Eastern Market is set to reopen on Sunday Friday June 26. The structure has been closed for two years due to a fire, and the art vendors and farmers market tables have been located outside since then. Eastern Market is a great weekly weekend event in the Capitol Hill section of DC, that features farmers markets, homemade arts and crafts, and a flea market. The neighborhood is also home to some great little shops and restaurants. Thanks to DC Metrocentric for alerting me! The annual Taste of Arlington had a full turnout today in spite of the forecast of possible rain. The event was sponsored by the non-profit Community Residences and was very family friendly, with a moon bounce and a 'Vertical Reality' harnessed trampoline for the kids. 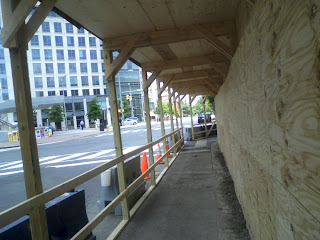 The event took place on Wilson Blvd between Randolph and Taylor streets in Ballston. A $25 ticket allowed guests to get 8 "tastes", which could be redeemed at tents hosting every restaurant in the area. All variations of eats were available, from Whole Foods, Willow Bar, Union Jacks and Melting Pot to name a few. Lots of free entertainment was provided during the day, starting with a poetry reading by Bus Boys & Poets staff. The three man band One Ton Wonton then kicked out some funk rock tunes and a cover of Sublime. SoBe Seafood hosted a pet adoption event for Homeward Trails Animal Rescue today. The Mister Day's owned restaurant has a outdoor patio tucked away in the plaza directly across from the Metro station. Today that patio was filled with all types of breeds of dogs looking for homes. Other local adoption agencies of note is the famous Lost Dog Cafe on Washington Blvd and Capital Cats in Eastern Market. Taste of Arlington is happening this Sunday, May 17th. This annual event features live music and food on Wilson Boulevard in front of the Ballston Mall. "Over 40 restaurants participate in this spectacular community event, which draws an average of 10,000 people each year who live in the greater Washington, D.C. area." Starts at noon and ends at 5pm, rain or shine. For more information and parking details, click here. Another full house at RiRa's weekly free comedy night presented by StandupComedyToGo. There seemed to be a sorority or high school reunion attending, as half the crowd was somewhat inebriated late twenty something females. One of them even tried her first attempt at stand up that ended in what would become an infamous joke about "bleached assholes." Like most of RiRa's stand up nights, it featured a mixture of newcomers and comedy veterans like Hampton performing. The night concluded with the hilarious Tony Woods improvising most of his ten minute stand up routine. President Barack Obama and Vice President Joe Biden ate lunch decision at Ray's Hell Burger in Courthouse today! I love how they paid cash and waited for their food like everyone else. Murky Coffee on Wilson and Washington Boulevards closed its doors for good today. Its no surprise as owner Nick Cho gave us all a month's warning that the quirky shop would be shutting down soon. The owners of Liberty Tavern are posed to open a new coffee shop in the space vacated by Murky. I think Murky will be missed. It was nice that Clarendon had its own unique little anti-Starbucks store.